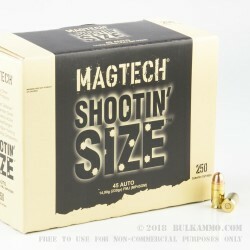 The name of Magtech’s Shootin’ Size line of ammunition is attributable solely to its packaging. They know that when you’re taking the trouble to go somewhere where you can shoot at your leisure, you’re going to want to work your way through a substantial number of rounds. With the 250 cartridges neatly tucked away in this beefy box, it is likely all you’re going to need for the day! 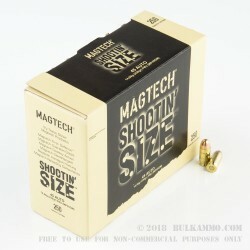 This 45 ACP cartridge has a 230 grain projectile, which is about as hefty as bullets commonly available in this caliber come. 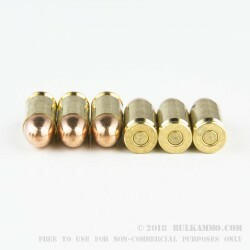 The bullet sports a full metal jacket, which will save your bore from the lead fouling that would surely have spoiled your accuracy if you plan to fire this box’s entire contents in one go. 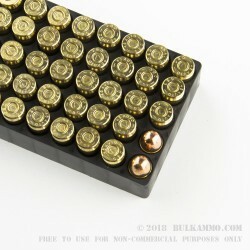 And with its non-corrosive Boxer primed brass casing, you’ll be able to keep this trove of rounds alive via handloading for a good, long time.